By Randy Mueller on November 28, 2018 for LOCAVESTING. Since their inception ten years ago, the Evergreen Cooperatives in Cleveland, Ohio have served as a promising model of economic development in a post-industrial city. 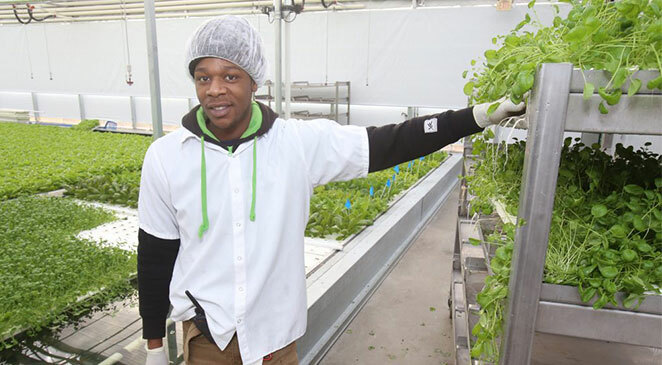 The three worker cooperatives—an industrial laundry company, a green energy services contractor, and a hydroponic greenhouse (pictured above)—collectively employ over 200 individuals, many of whom have become worker-owners. In a city where median household income hovers around $18,500, these companies pay their workers a living wage and share with them the profits they produce. Despite widespread national interest, the “Cleveland Model” hasn’t spread far. And renewed excitement for employee ownership hasn’t yet translated into significant growth in the sector. Now, the Evergreen Cooperatives network is taking matters into its own hands with a new fund that will acquire existing companies from retiring business owners and sell them back to the employees. This conversion strategy is gaining popularity among advocates of worker ownership in the face of a “Silver Tsunami” of retiring baby boomer business owners. The Fund for Employee Ownership, as the Evergreen fund is called, is the latest and perhaps most potent initiative aimed at expanding employee ownership and the principles of democratic governance. Start.coop, a newly launched accelerator, is looking to help build a new generation of large, high impact cooperatives. And Transform Finance, a leader in the impact investing movement, is crafting a blueprint for an employee ownership conversion fund that could address the wave of retiring business owners. Evergreen’s Fund for Employee Ownership, in fact, shares many of the same characteristics as Transform Finance’s proposed fund model. The new initiatives and capital may signal a turning point for worker-ownership. “There has been very little innovation in the past couple of decades” within the employee ownership ecosystem, says Jessica Rose, CFO & director of employee ownership programs at The Democracy Collaborative and an advisor on the development of the Evergreen fund. The fund’s first investor, an unnamed foundation, has provided a $5 million debt investment of concessionary patient capital. Evergreen is hoping to find partners with similar investment terms during the “proof of concept” phase for the fund, says Rose. Through its “acquire, convert, support” approach, the Fund for Employee Ownership will facilitate the transition from a traditional ownership structure to one in which the employees own the company. “We’re pooling impact capital to locate great businesses, purchase them, convert them to employee-owned, and support them by bringing them into the Evergreen network,” Rose says. While each acquisition may vary, Rose anticipates they will involve a leveraged buyout, much like Transform Finance’s proposed fund. The conversion might include one or two transactions−either a straight sale between the owners and employees, or a two-step process in which the fund acquires the company, holds it for a period of time, then sells it back to the employees. The ownership structure for acquired businesses will be decided on a case-by-case basis. Whether a converting company establishes an employee stock ownership plan (ESOP) or becomes a worker cooperative, certain characteristics of worker ownership must be in place, including democratic governance and equitable wages. “Whatever form of employee ownership we select, we want its participatory culture to be meaningful,” Rose says. Once the company is owned by its employees, it will receive continued support from Evergreen Business Services, a for-profit company that offers consulting to growing businesses. That will include traditional services such as market research and customer relationship management, as well as support for issues specific to an employee-owned company, such as building a democratic culture. The Fund for Employee Ownership will initially target service and manufacturing businesses located in Northeast Ohio, with the first acquisition of a small or mid-sized company in 2019. The long-term goal is to prove the viability of the fund model, attract more institutional capital, and replicate it throughout the country. Advocates of employee ownership see conversions as a necessity for maintaining the vitality of local economies. Eighty-five percent of baby boomer business owners lack a succession plan for their company. A recent report by Capital Impact Partners found that 9 our of 10 small businesses in operation for more than 25 years could not find a buyer. The resulting business closures can imperil not just the owner’s retirement, but local jobs and tax revenues. Through partnerships with the Evergreen Cooperatives and other organizations, Rose and The Democracy Collaborative have served in capacity-building roles to create more employee-owned companies. Rose and her colleague Marjorie Kelly recently founded the Fifty by Fifty initiative, a project that aims to build an economy in which fifty million Americans are employee-owners by 2050.